A few readers have asked me to revive this column, which I discontinued a couple of years ago. (You’ll find the old columns all stored here if you’re looking for unusual films). In the late 1960s audiences tired of old-fashioned pictures and made ‘Easy Rider’ a hit. The studios were caught out. What were they meant to serve up to the public? Director William Friedkin understood the problem; he’d started with stagey filmed plays like Pinter’s ‘The Birthday Party’ and Mart Crowley’s ‘The Boys In The Band’, only to reinvent himself as a maverick using fashionable camera techniques. But before his more visceral films like ‘The Exorcist’ and ‘The French Connection’ he made this, which roughly covers the same subject matter as ‘Gypsy’ in a very different way. Shot virtually in real time over the course of one evening, it looks at the dying days of burlesque, ‘the poor man’s vaudeville’, diving inside the Lower East Side society that produced Harold Minsky’s risque shows. There’s minimal plot; a virginal Amish girl gets a job performing bible stories in the theatre as a sop to the censors, but is being used to set up a vice sting. Her mixture of innocence and sexuality affects everyone, horrifying her father, dividing the low comics, forcing moral choices out of people who’d forgotten they had any. 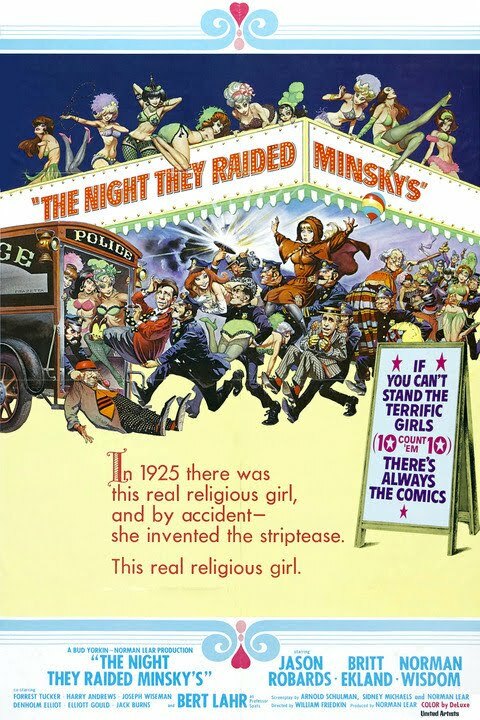 The film was billed as a raucous comedy in this Frank Frazetta (!) designed poster, but is a very different animal indeed. It’s filled with the kind of shots that were popular in the late sixties; rapid cuts, crash zooms, documentary footage, mixes of black and white and colour, sound collages, hand-held cameras. Along the way it manages to be a love letter to the New York of the roaring twenties, a farce and an elegy to a vanishing way of life. The film is rowdy, chaotic and filled with street people; old Broadway Jews crammed into delis shovelling food, fighting and bargaining, punters desperate for a glimpse of stocking, has-beens who’ve been around hustlers too long. 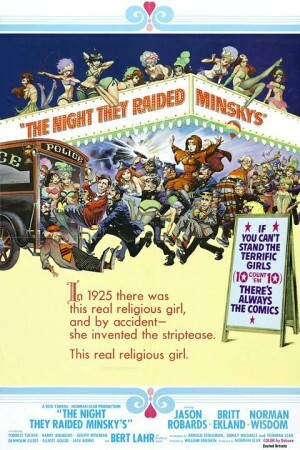 The cast is eclectic to say the least; Elliot Gould as Minsky’s silver-tongued son, Britt Ekland as the wide-eyed girl, Harry Andrews as her thunderous father, Denholm Elliot as the outraged censor, Jason Robards and Norman Wisdom as the low comics, Rudy Vallee and Bert Lahr, the cowardly lion himself, as the old-time troupers. The film catches the repetitive grind and forced jollity of burlesque as it intercuts red-faced punters with girls whose every movement warrants a cymbal-beat. Two particular scenes stand out; one in which three men of different faiths end up praying together, and an elegiac end-shot of Bert Lahr looking at the wrecked stage after everyone has left, denied his final chance to go on, knowing that the theatre will close and his world will disappear. Many involved with the production had a real-life connection to this world. Wisdom’s reined-in act is full of physical grace while Minsky himself is a wise and worldly father to his skid-row children. The film is not quite arthouse and hardly mainstream – a B movie designed to go on the lower half of a bill perhaps, which is where I first saw it. Charles Strouse (another old Broadway talent) wrote the period soundtrack. Instead, my very best wishes to Alan M and his ‘Other Half’ for Monday 21st.